Paint the ball pink and the cup green and leave to dry. Glue the ball to the bottom of the cup. Cut two arms from green foam and two hands from pink. Glue one hand to the end of each arm and the other ends of the arms to the body. Cut a strip of black foam and glue it around the middle of the cup as a belt. Add a buckle from a circle of yellow foam. Make a hat by cutting two hat shapes from green foam. Glue one either side of the head, sticking the edges together. Add a strip of black foam and a yellow foam buckle. From orange foam cut a beard and some hair. Glue these on. Finally, add two eyes, a red circle of foam for the nose and draw on a mouth. 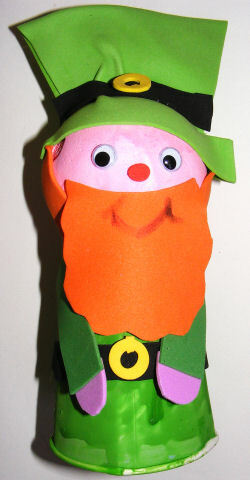 Team this quick leprechaun beard craft with our leprechaun hat and the kids will be ready for St Patrick's Day! This funny little elf could be busy at Christmas helping Santa Claus, or causing trouble for St Patricks Day!